Following its successful premiere last year, the Smart Factory Hackathon is now in its second round. Various Audi departments from the Press Shop, Body Shop, Assembly and Logistics had provided real, anonymized data sets. True to the motto “Data drives our production – You innovate from our data” the programming geniuses in groups of three to five participants with expertise in IT, math or communications design fine‑tuned digital solutions for the specified problems. To do so, they had 25 hours, based on Audi’s 25th hour – the “extra hour”. This extra hour stands symbolically for the time gained with autonomous driving. The six‑strong jury of Audi experts, external IT specialists and business consultants assessed the results. Technical methodology, user‑friendliness, value added and type of presentation are key elements in the overall verdict. The audience’s votes were also incorporated into the assessment. 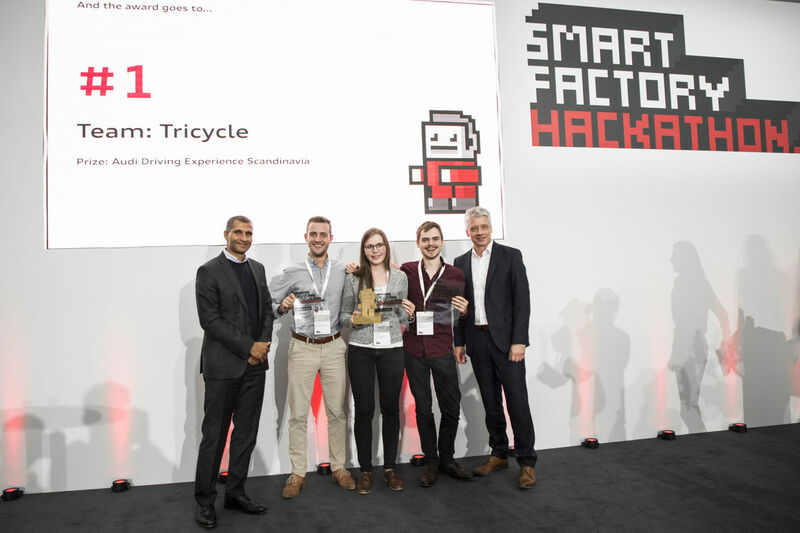 The company is currently driving forward around two thirds of the ideas from the first Smart Factory Hackathon in 2016 and integrating them into production in cooperation with the teams. This year too, Audi will follow up on the most promising solutions with the Hackathon participants and implement them in production. The three best‑placed teams will also be treated to an Audi driving experience.